The President, a Muir & the Buffalo Soldiers in Yosemite This Weekend?! Wow!! The very thought fills me with ecstasy. They say time is circular, not linear, and the time has come around again for a President of the United States to be in Yosemite National Park at the same time as a descendant of John Muir who's bringing forward the legacy of the Buffalo Soldiers! What are the odds that, 113 years after the fateful meeting between President Theodore Roosevelt and conservationist John Muir under the watchful eyes of the real life Buffalo Soldiers, the stage could be set again for such a meeting in the paradise known as Yosemite? That meeting in 1903 spawned the greatest conservation effort on Earth, up to and including the establishment of the National Park Service, a special branch of government mandated to take care of the parks, historic monuments and battlefields we conserve. Eerily, in 2016 when the agency celebrates its Centennial Anniversary, the conservation movement is on the verge of bridging a racial divide which has existed since its formation: The first United States President of African descent has protected more of our pristine lands and waters than any other (over 265 million acres) and is dedicated to "make sure the American people are able to enjoy the incredible national parks, the incredible beauty, the mountains, the oceans that have been one of the greatest gifts that we've ever received; to make sure that the whole world is able to pass on to future generations the God-given beauty of this planet." John Muir's great-great-grandson Robert Hanna who is keenly hoping to reprise that historic moment in the park this Fathers' Day weekend, is also striving to get the Buffalo Soldiers' route into the park renamed "Buffalo Soldiers Memorial Highway." 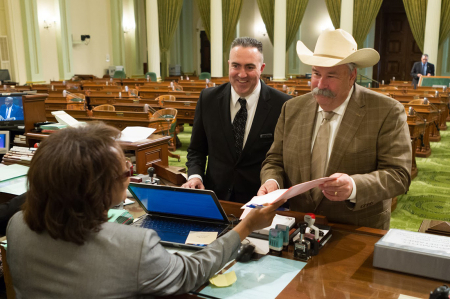 Robert Hanna, (l) with California Assemblyman Frank Bigelow introducing the Resolution to create the Buffalo Soldiers Highway. "Can you imagine how our meeting could relight the fire of imagination, solutions, and togetherness that was lit by my great-great-grandfather and President Theodore Roosevelt in Yosemite over 100 years ago?" Hanna wrote to the President. He deferred to the First Family's right to enjoy their vacation without interference. Dedicated to carry on the conservation legacy of his great-great-grandfather, Hanna has focused for years on bridging the most persistent gap - the alienation of non-white Americans from our parks. "We have to build a conservation movement that will last, especially to address our changing demographics and our changing climate," says Hanna. 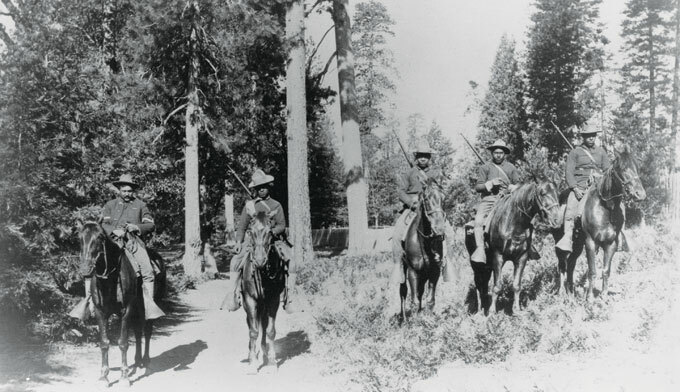 The Buffalo Soldiers patrolling Yosemite National Park near the turn of the 20th Century. NPS photo. 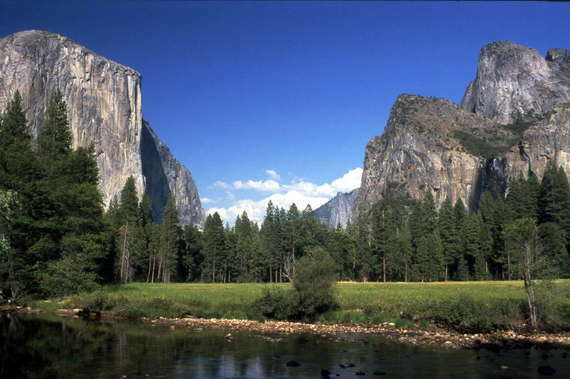 I am busily inserting myself into the President and First Family's tour of national parks this weekend. I have not yet visited their other destination, Carlsbad Caverns so I am sublimating in the feelings of freedom and release I experience at their other stop - the heavenly realms of Yosemite National Park. In a week when our national consciousness has been battered by the assault on our fellow citizens in the LGBT community; when a child met an ugly fate in a resort associated with the fulfillment of childhood dreams, and when the Commander in Chief of our great country has literally been accused of being a terrorist sympathizer by the presidential nominee of a major political party, my soul flies up to Yosemite. My spirit recalls the joy of driving up the mountain with those expansive views spread out below me, and the appearance of enchanted Yosemite Valley taking my breath away as I emerge from the tunnel. El Capitan on one side rising into the sky and Half Dome on the other form a "gateway" that draws me into a magical world. It's not an exaggeration to say I feel as if I'm entering a Garden of Eden. 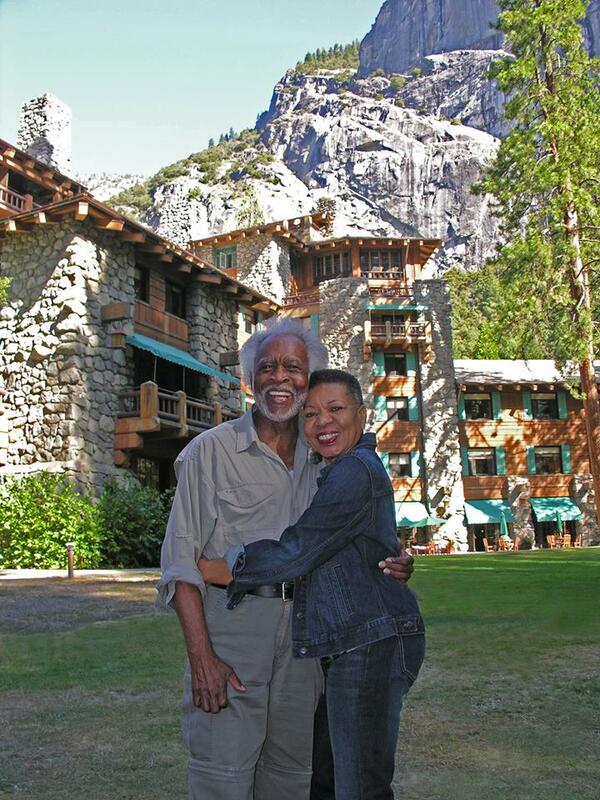 The gracious old Ahwahnee Hotel is one of the most romantic destinations for Frank and me. Now I cannot even trouble myself to learn the 'new' name. Ken Karst photo. This unacceptable outcome makes me even more concerned about the future of our priceless National Park System now that a director's order purposes to relax the rules that have limited the corporate presence in our parks for more than 100 years. But we've already suffered too much this week so I will leave that conversation for another time. 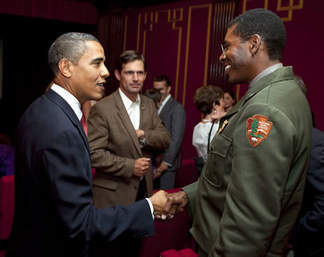 I hope President Obama gets to reconnect with our beloved 'Buffalo Soldier' Ranger Shelton on the trail in Yosemite after their meeting here in the White House a few years ago. This Father's Day weekend, I'm hanging with the First Family in Yosemite National Park. I hope a President and a Muir get together again and the Buffalo Soldiers come out of the shadows of history. I'm questing for all Americans to visit our national parks and forests or some undisturbed part of Nature, and in the whisper of the wind hear the subtle call that we are all children of one God. Whatever we conceive him or her to be one thing is indisputable: God is Love. Any action that lacks love for one's fellowman and all life cannot lay claim to God. It's just that simple to me.